Crafting Adventures: A Christmas Card... at Last....! A Christmas Card... at Last....! I've just realised that I need to take back what I said yesterday about purple papers.... I love these bad boys too! Well done Cosmo Cricket - I knew you were one of my fave paper manufacturers for a reason! 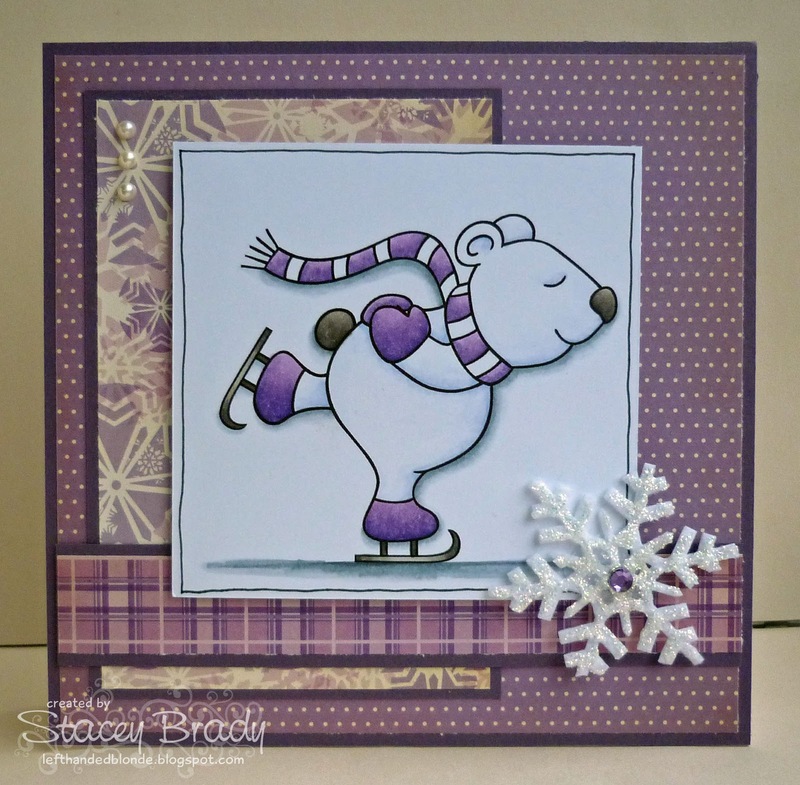 Stamps: 'Polar Bear Ice Skating' by Pink Cat Studio. Paper: 'Mitten Weather' by Cosmo Cricket. Copic Markers: V12, V15, V17, W1, W3, W5, W7, C1, C3, C5, C7 - available HERE from Dies to Die For. Tools & Embellishments: Martha Stewart Die Cut Felt Snowflake Ribbon, available HERE from Dies to Die For, Stickles and gems from stash. Stamp with Fun - Snow. Papertake - Cold & Frosty Morning. Cute Card Thursday - Monochrome. I hope you are all having a lovely weekend so far. Hope to see you again soon! Ooh I love it! I also love this gorgeous pad and the spangly snowflake! I hope you're having a fab weekend! Another one of my faves...and I actually DID use some of this dp Stacey!LOL!! I made Christmas cards this year just never sent them off so at least I have a stash already built up for next year right!?!LOL!! Beautiful card! A real cutie Stacey, and I'm loving the purple papers. sooo lovely creation I think the bear is sooo cuddly and the snowflakes pretty! Thanks for join at the totally gorjuss challenge this week!